Getting used to life back home in Deer Park, North Carolina, Sydney McCall and her right-hand tabby, Toby, are helping her sister Kat run the local animal shelter. Syd and Kat are all excited about the prospect of the shelter’s newest fundraiser: shopping channel queen Ulla Townsend. Shelter admin Maggie Shayne vehemently refuses to have anything to do with the woman, but the fundraiser ensues as planned. That is, until Ulla turns up dead in the middle of the event. The cause of death is determined to be an allergic reaction, but Syd and Toby are sniffing out something fishy. When Syd met Ulla, it was clear she was distasteful and rude. And right before the event, Syd spotted some behind-the-scenes drama between Ulla and her manager. As they begin to investigate, they realize there is no shortage of suspects, and Maggie is at the top of the list. Now Syd and Toby must claw their way to the truth before everything goes paws up at their animal shelter in Death by a Whisker by national bestselling author T. C. LoTempio. Sydney McCall has returned to Deer Park, North Carolina. Sydney plus her tabby cat, Toby whose antics with Melvin the Marvelous Mouse will make you chuckle, are helping her sister Kat at the Friendly Paws Animal Shelter. They are gearing up for a cat adoption and a book signing at Tara’s bookshop. The Friendly Paws will receive a percentage of the book sales plus take applications for some of their fur babies to find their forever homes. The book takes off quickly providing the reader with a myriad of cats described so vividly you can see and hear them. The story keeps up an invigorating pace right up to its dramatic conclusion. The original author has to back out of the signing so in his place, a former Deer Park resident who is now a shopping channel star and has written a tell all book will be there. This person, Ulla Townsend was a cruel person in high school pulling many pranks that ended badly on her classmates. In her professional life, Ulla has not changed. She is not very well liked by her crew. What a surprise when Ulla has a attack with the end result of death!!! Seems she had an allergic reaction. but what caused this reaction?? The characters were all well defined, creative, vivid and complex involving the reader in the story by the fluid description used. There is plenty of mystery, suspense, drama, twists and turns plus intrigue to keep the reader on their toes. Snyder gets involved with the investigation even after she is warned not to interfere by a new arrogant detective plus she also receives two mysterious notes to stop investigating. 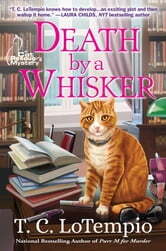 A well written cat friendly cozy mystery. I volunteered to read the book. Thanks to the author and publisher via The Cozy Mystery Review Crew for the book. My opinion is my own.